3,2,1. The theater goes dark. The screen lights up. There is motion. This is sound. There are graphics and text dancing across the air. You are taken away to a world away for 120 minutes with anticipation. How genius is that title sequence? Will the movie be as good? If it is, you are going to love this movie. With my regular series (Remember The Title / Also referred to as RTT) I present to you my favorite title sequences for my best-loved movies. I start with my favorite title sequence of all time - Catch Me If You Can. 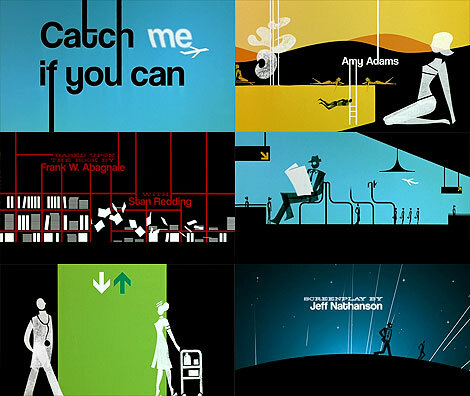 The typography, style, and animation are so cleverly executed in the title sequence for "Catch Me If You Can". Based on the movement of the chase, the title is playful, using brightly colored animation, stylized people and scenerios. A tribute to Saul Bass, designer responsible for “The Man With The Golden Gun”, we are taken through a variety of locations where the main figure changes his identity represented with arrow icons. The word "Me" vanishing as a cloud is pure genius. haha, you and those crazy fonts! But, I agree that Catch Me If You Can has a great style and look throughout - including the title sequence. I also like that on the DVD you can choose the main menu animation by selecting either a pilot, doctor or lawyer.